It was certainly a fantastic weekend weather-wise courtesy of a big dome of high pressure building in from Canada. The dry air and clear skies at night will mean a few almost chilly mornings until the second half of the week, when the center of the high shifts slightly offshore and a change in wind direction will bring in more humidity. Milder starts to the mornings, sunshine and southwesterly winds will lead to summerlike temperatures in the afternoons. A weak cold front will approach the area on Friday and basically stall out. But that may provide just enough lift to the atmosphere with the increased humidity to bring a few light showers. It’s not back in a formal drought yet, but September finished 2.29 inches of rainfall below average for the month (Washington-Reagan National data) and the topsoil is getting pretty dry. The are could use an all-day soaking rainstorm for that reason alone. Further down the road when there would be plenty of fallen dry leaves, fire weather danger would only increase. Also worthy of note, as of this article’s publication, there is no active tropical activity in the Atlantic Ocean. Seasonable average highs this week are in the low to mid 70s and average lows are in the mid 50s. 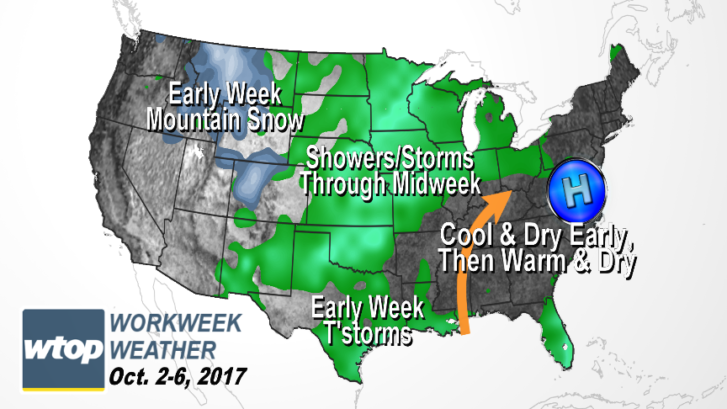 Editor’s Note: The WTOP Workweek Weather Blog is intended as an in-depth yet plain language summary of the business week’s weather potential in the D.C. area along with an explanation of the contingencies and uncertainties that exist at the time of publication. For the latest actual Storm Team 4 forecast, check out the link on the main WTOP Weather Page.